Things to avoid: Do not wear your jewelry in the shower or pool or wear them to bed. Do not expose jewelry, beads etc. to high temperatures like your car dashboard, or spray them with hairspray or perfumes. Children: All products on the Azure Aster site are intended for ages 14+. Do not allow children to play with beads or let them place any jewelry, findings etc. in their mouths because they may accidentally ingest them. Small parts are a choking hazard. Never leave them unattended or allow them to go to bed with their jewelry on. We understand that some of our designs are just too cute to resist and some of our beads look good enough to eat, so please keep your little ones safe! Cleaning your jewelry: Non-painted polymer clay pieces may be wiped with a damp cloth or washed with a mild handsoap. Many chemicals eat through polymer clay so ammonia and other cleaners should be avoided. Metalized, plated or sterling silver pieces may be cleaned with a jewelers polishing cloth and light buffing. Cloths are available here. Rhinestone, vintage or antique jewelry: Cleaning rhinestone and antique jewelry can be tricky. The main thing to remember is if it has rhinestones, is plated and has lots of nooks and crannies, you do not want to get it wet or allow it to stay wet for a long period of time. This is how verdigris (aka green gunk) starts. We go with the recommendations of the costume jewelry circles. Always start out with the least harsh cleaning method you can. Sometimes the patina is desirable so you might want to let it stay as-is. The exception to this would be verdigris. Verdigris should be removed ASAP. Be sure to separate any jewelry that has verdigris. See more verdigris info below. We clean our rhinestone and costume jewelry with a polishing cloth. If necessary we will use a mild liquid jewelry cleaner that has no ammonia or alcohol etc. We will use the smallest amount of liquid cleaner as possible and make sure the piece is completely dry before it is put away. We have liquid cleaners for solid gold and solid silver pieces. We also use Mas polish and Simichrome. Final polishing is done with a jewelry polishing cloth and we make sure the piece is dry before we put it away. You may use Simichrome to polish and clean bakelite and plastic pieces. We also use a mild liquid jewelry cleaner if necessary. Verdigris: Ah the bane of all jewelry. Verdigris happens when moisture or things like makeup are left on jewelry pieces for extended periods of time. If you collect or wear vintage jewelry, you will run across verdigris at some point. Our verdigris arsenal consists of and is used in this order: a magnifying light, a large artists soft brush, a very soft toothbrush (toddler brushes work well), Q-tips, toothpicks, dental floss, mild liquid cleaner, Mas polish and Simchrome. The last resort is ketchup. As soon as I have some time, I will be writing a more in depth article on cleaning jewelry for the site so stay tuned. Children's Jewelry: All products on the Azure Aster website are intended for ages 14+. We are not currently designing jewelry for children. 1. Any items created from Polymer clay. 2. Solid sterilng silver or gold jewelry, beads, charms and findings. 3. Glass beads and findings. 5. Brass charms and findings. 6. Surgical steel jewelry and findings. 10. Silicone rubber cord, leather cord, satin/fabric ribbons, wood or feathers. 11. Lucite or plastic items. 12. Any adult jewelry pieces described as "Lead Free", "Safety tested for lead" "Lead Safe", "Lead Compliant" or as "meeting federal or state requirements for lead". 1. Swarovski crystals, Austrian crystals or leaded crystals. 2. 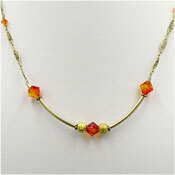 Fire polished glass crystal beads. Proposition 65 information: Attention California residents. Proposition 65 WARNING. Consuming foods or beverages that have been kept or served in leaded crystal products or handling products made of leaded crystal, will expose you to lead, a chemical known to the State of California to cause birth defects or other reproductive harm. This warning applies to all items described as containing Swarovski or "Austrian Crystals". Our crystals do contain lead so please do not chew on, injest them or use any items with food products. For Children: Effective 9/01/07: We are no longer creating jewelry for children. For Adults: Effective March, 01 2008: The state of California's Jewelry law (AB 1681) takes effect March 01, 2008. This law applies to anyone selling jewelry to or from California and includes all adult jewelry pieces. It is more strict than the current federal standards. In addition, California is not grandfathering components manufactured before the law went into effect. Unless an item is labelled with lead information or it was pre-tested by the manufacturer, Azure Aster cannot be sure of its actual lead content. So we will no longer ship untested items or those not already tested or labelled as lead free, lead safe or lead compliant by the manufacturers to California effective March 1, 2008. In the meantime, we are doing everything we can to obtain written documentation of lead testing from our suppliers and are working on bringing in more lead free items. Minnesota has now adopted a law that is basically the same as California's.